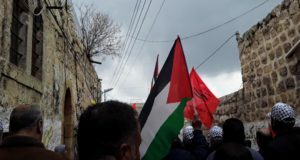 On Thursday August 23, Mumen Mahmoud Raja, 18, was arrested at his home by Israeli occupation forces at 2:30 a.m.
Around 2 a.m., some 60 Israeli forces invaded the Palestinian village of Burin, located south-west of Nablus. 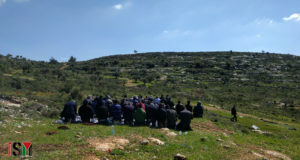 They arrived in 6 military jeeps, a truck, and 16 individuals by foot from the illegal colony of Givat Arosha, located atop a hill near the village, Mumen’s father estimates. 20 soldiers entered Mumen’s house, waking his family, including his 8 year old brother. “We thought they wanted to arrest our other son, Montser, 19, who was arrested three months ago for 10 days. But then the soldiers began to demand Mumen, and took him away,” Mumens father recounts. This family, like most families in Burin, endures the arrests of their children without being given a reason for their detention. At 3 a.m., the soldiers left the house after checking the identity of the remaining family members. “It is the first arrest now that Ramadan is over, and we believe there will be more in the coming weeks,” says Ghassan Najjar, resident of Burin. Since January 2012, Israeli forces have arrested 35 young men in Burin in night raids. Currently 16 of them are still imprisoned, aged between 15 and 32 years. 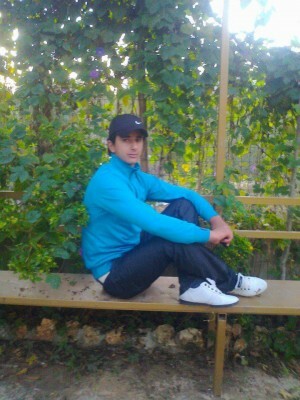 Three of the current prisoners are minors; Walid Eid, 16, Eid Maomen, 16, and Qais Omran, 17. Burin has been subject to many arrests on a daily basis for the past several years. The village is surrounded from all directions by three illegal Israeli settlements: Yitzhar, Bracha, and Givat Arosha. 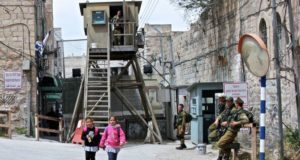 The Israeli military often patrols through the village at night raiding homes, and arresting members of Palestinian families without indicating a reason. The harassment and arrest of Burin’s youth, particularly those with a connection to the youth community centre in the village, is common. Alma Reventos is a volunteer with the International Solidarity Movement (name has been changed).